The second program I’m reviewing today is called BitXgroup Ltd. It has been monitored on DavidNews.com for 6 days and has been online for 9 days in total. BitXgroup Ltd has joined Golden Stage and I have reinvested in it $400 to monitor its performance. Currently, it has “PAYING” status on our monitor and there is not much to say about it yet. Keep reading to find out more about its investment plans and other features. 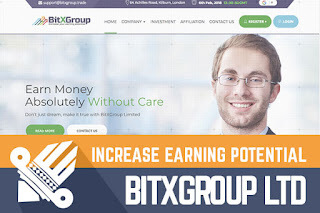 BitXgroup Ltd is offering 3 investment plans – “3.5% Daily for 50 days”, “0.25% hourly for 540 hours” and “115% after 10 days”. They might look confusing at first glance, but they are quite simple. It’s just that profit is shown using different values. With a few calculations we can make them more comparable – 3.5% a day, 6% a day and 11.5% in the last plan. It’s obvious that the third plan is the most beneficial. The minimum deposit is different for all three plans - $20 in the first plan, $300 in the second and $50 in the last one. Minimum withdrawals $2 for PerfectMoney, AdvCash, Ethereum, Litecoin, and BitcoinCash, but $3 for Bitcoin and there are no withdrawal fees. I assume this is enough information to decide if it’s worth to keep reading this review. Later I will go more into details of the most beneficial investment plan. The main language of the website is English, however, there is a Google translate function integrated on the website in case you prefer reading automatically translated content in any other language. The website is built using the licensed version of DQScript. It’s not the most common used HYIP website script but I assume that competition is a good thing. In fact, often I see poor design and functionality websites built on the most popular script sites. I believe it has nothing to do with the quality of the script but with the work done by admin. Live chat function is available on the website in case you have any urgent questions. In the meanwhile, the main “Contact Us” button on the home page leads the visitor to the “Contact Form”. Moreover, HYIP representatives can be reached via email address. Admin has placed a London based address on the “About Us” page. The program has a UK company registration details on the website. Instead of placing company certificate, admin has made “Guarantee Certificate” and signed it himself. Well, probably Kyle Northon is not an admin, but he has placed his signature on the certificate guarantying safety of investments. Well, I wouldn’t be too sure about the safety of investments in any of HYIP’s, but still, this approach stands out of the crow when all other admins place the company registration certificates. Remember, none of these provide any guarantee – registration certificates or self-made guarantee certificates. I have seen a similar type of legends with the company history displayed in chronological order before. They all begin with the start of Bitcoin. This legend is not an exception and the first entry point is “Advent of Bitcoin” in 2009. 8 years later we see “Establishment of BitXGroup Limited” which is backed up by the text that clients are welcome to discover a new world of crypto-currency trading and reliable exchange transactions, carried out by world-class professionals. The year 2018 is called “Expansion of BitXGroup Limited”. Feel free to do a good read but the main essence of this legend is that BitXGroup Limited positions itself as a crypto trading HYIP. In fact, all HYIP legends are nice-to-have, but we can’t check if any of them are based on true facts. This legend is another example of generic legends, which can be used later for any other program and most likely will not be remembered. The overall impression of BitXGroup Ltd website is positive. It’s functional and all major information can be found on the homepage within a few scrolls - investment plan details, main selling points, referral program information, payment options and contact information. Moreover, admin has made extra effort structuring the FAQ page content. It’s a small thing but helps saving time for me and potential investors. It’s well-structured within 5 main categories – general, account, deposit, withdrawal, and referral. Sure, it’s only a matter of user experience and has no impact on the performance of the program in the long run. I already gave you a brief introduction to BitXGroup Ltd investment plan information. In my opinion, the most beneficial plan is 115% after 10 days. Minimum withdrawal for this plan is $50, which is $30 higher than in the first one. Minimum withdrawal in all plans is $2 or $3 depending on the chosen payment option. I just realized that the hourly accrual function for the plan 0.25% is not very convenient due to the minimum withdrawal. However, I assume there are not many investors that are willing to check the investor panel every hour. An investment of $200 in the plan would generate total net revenue of $30. In fact, it’s not much different than the plan offered by the program in the first review (20% in 10 days). We are looking at short-term investment plans with initial deposit included in the payments. Comparably low, but realistic interest rates. Tomorrow one of its plans will complete the first investment cycle. I have already mentioned everything that came up into my mind about the status of this HYIP. Keep in mind that none of the HYIP investments are guaranteed and it’s your decision to invest or not in any program. Therefore, if you ever decide to make any investments, don’t invest more than you can afford to lose! Have you already made an investment in BitXGroup Ltd and have any useful information to share with us? Please help others by sharing yours know how in the chat box! Investment plans: 3.5% DAILY FOR 50 DAYS, 0.25% HOURLY FOR 540 HOURS, 115% AFTER FOR 10 DAYS. Invest in Ethereum on eToro the World’s Best Social Trading Network. Join millions who have already discovered easier methods for investing in Ethereum.